The day has finally come when we leave Dubai. Moving to New Zealand is turning out to be a drawn-out process. We moved out of the flat in Capricorn Tower three weeks ago, with the help of Crowne - again, and after a serious clear-out. It will take two months for our belongings to arrive in Wellington after a journey by container ship via Singapore, so we decided to pack up early. I hated leaving our amazing flat and still miss the view down Sheik Zayed Rd every day. We spent our remaining time - until Stuart finished working at DIFX - living at Donna's house in Jumeirah, which also helped enormously with the editing of the documentary. Donna looked after us magnificiently, and we have never eaten so well. The hardest part was saying goodbye to the friends we've made. Even after the leaving-do Claire and Carla arranged for us on the Dhow at Mina Seyahi we still had a host of lunches and dinners organised. It was so good to see everyone again for one more time, and I realised how many fabulous people we got to know during our time here, a whole Dubai family. This is the last entry in this particular blog. My intention in writing it was to show what our life was like here in Dubai, to dispel some of the myths about expat life in the Middle East and to keep in touch with our friends in Europe (and elsewhere). 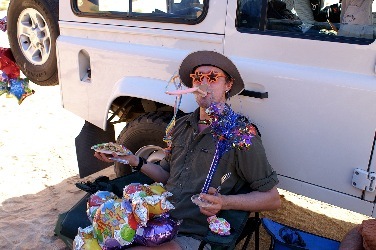 Still, if you are interested in our adventures Down Under, Stuart is taking over and has already started his blog. Much more technologically advanced, it features an RSS feed so that you can make use of your news reader to keep up to date with us. Go there now! We are doing lots of things for the last time in Dubai now. Mark and Martina are here, so for our last desert drive before it's too hot, and before we move on, we chose to go to Liwa oasis. Liwa is in the far south of the UAE, on the border with Saudi Arabia. 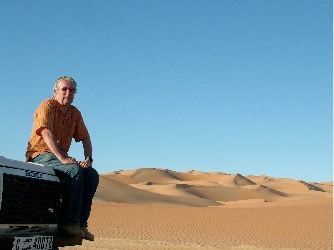 It's on the edge of the Rub Al Khali, the Empty Quarter, the biggest sand desert in the World. It reaches all across the Gulf peninsula up to Jordan and down to Jemen. We were planning to drive alongside the main track through the dunes and then maybe head over to Al Ain and into the mountains, a week-long escape from Dubai traffic into the quiet emptiness. So we packed the cars with food for a week, spare fuel and two jerrycans of water, sleeping bags and tents. We set off about lunchtime at a slow relaxed pace on the way to Abu Dhabi, then turned left and headed inland on a road as straight as if drawn with a ruler. 100 km further we hit Liwa oasis, a crescent-shaped line of ragged houses lining the road in between vast fields of vegetables and alfalfa. 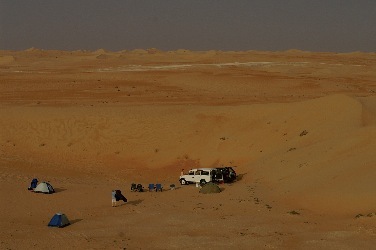 We struck out into the dunes, as big as we've ever seen, only to get stuck 200 yards of the road. When we couldn't get out after an hour of pushing and shoving, using sand ladders, our new inflatable jack and a lot of elbow grease, we gave up and camped in the lee of a dune. The next morning we went for help with the Range Rover, which wasn't stuck, and found some rope and a man with a rickety Landcruiser van who kindly helped us to get out. After that we were more careful. Obviously the combination of softer sand and a heavier car (more people and gear) meant we could not be quite as gung-ho as we normally are. We spent a few extremely quiet and peaceful days roaming the Liwa dunes, and then wanted to move on to Al Ain via the inland route, but were turned back at the halfway point by a fence and some intractable UAE border guards. The area is sensitive for various reasons, it being the location for oil drilling as well as a badly maintained border to Saudi. We had to make do with the long way round via Abu Dhabi and the coast road. At Al Ain we visited Jebel Hafeet again, mostly to make use of the pool after four days of washing with a thin jet of water from the pump. What bliss to jump into endless gallons of it! Martina is relishing the fact that there is water EVERYWHERE! We continued on explore some of the campsites in the Al Ain area we hadn't got to before, found a beautiful waterfall and a great remote plateau overlooking the Hatta mountains, but were severely disappointed by the amount of rubbish left by previous visitors and blown in on the wind. It's an ongoing problem here, there is a general disregard for the natural environment and many people just leave their crap behind regardless of the mess they've created. We have taken to always carry rubbish bags to at least collect and dispose of what we can even if we didn't bring it. 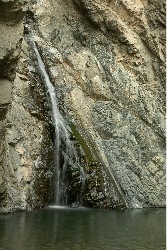 We spent the last night at our favourite spot near Hatta in a wadi far off the main track. There are pools there and at night it's quiet with endless stars. Finally we can talk about it. Stuart is leaving DIFX and we are leaving Dubai to move to..
After a series of protests by building workers and taxi drivers over work issues it's now the turn of Emirati women to make their voices heard. Popular democracy? 23 Emirati women staged a protest yesterday at the Ministry of Labour and Social Affairs, according to Gulf News, to complain about the curtailment of their rights after marrying non-nationals. Their main complaint was the fact that their social security payments of 1000 Dirhams had been cut because they were married to working expatriates, despite the fact that some of the husbands were unemployed and some earned as little as 1500 Dirhams. National women who marry foreigners lose their right to citizenship, their children are not Emirati citizens and therefore have no rights to healthcare, schooling and free university education, as well as other benefits UAE nationals normally enjoy. Children from these marriages can apply for a five year UAE passport, but have to give up the right to their father's nationality. These passports can't be renewed, leaving these children virtually stateless. These restrictions don't apply to National men who marry foreign women. Kuwaiti Ruler - Which One Is It? The last few days saw a strange and subtle spectacle play out across the front pages of Gulf News. It announced a different new ruler for Kuwait 4 times in 5 days. What happened is that the old ruler of Kuwait, Shaikh Jaber Al Ahmad Al Sabah died last week. His successor, in a country ruled by a single family, but with recent moves towards democracy with a parliament and discussions of voting rights for women, was going to be Shaikh Sa'ad Al Abdullah Al Sabah (Shaikh Sa'ad), the crown prince. But parliament wanted to nominate Shaikh Sabah Al Ahmad Al Sabah (Shaikh Sabah), the prime minister, saying that Shaikh Sa'ad was too ill to perform the job. As both Shaikhs belong to the same family, this is obviously an internal struggle between different branches, but the fact that parliament got itself involved is significant. In the region these parliamentary bodies are often not elected and have merely an advisory function. Kuwait has been trying to implement a more democratic system, but is constantly undermined by religious hardliners who see the end of the world as nigh if there is any democratic participation in the political process. So I bet with Stuart that despite reviews in Time Out the film would never make it to Dubai. Too contentious and too easily ignored. As it turns out the censors are expecting to review the movie this month and according to 7 Days a source in the censor's office said that they see no roadblocks to passing the film. Considering that homosexual activity is illegal in the UAE and cross-dressers get arrested at private parties, this is a surprising statement. We'll see. This new park opened last autumn, but it is so difficult to reach due to terrible signage that we only just went there last weekend. 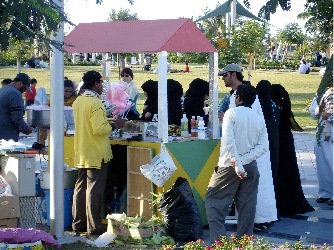 Zaabeel park is just a few minutes bike ride from our house, so an ideal local relaxation spot now that Emirates Towers park has been turned into an impromptu carpark (boo hiss!). We actually went twice. The first time we had to go by car because Stuart's bike had a puncture. Then we fixed it and went again on Sunday. The differences were remarkable: On Friday the place was heaving, every Indian family took the opportunity to have a picnic or a barbeque. On Sunday there were only national families and women with their kids. The beautifully designed refreshment shops are closed on a Friday, obviously, it being the weekend, but luckily the local corn and candy-floss franchise has enough initiative to provide snacks. As it turns out women are not allowed, among many other things, to watch live football matches in the stadium. All part of the 'special status' women have in Saudi, I guess. Bad news for the Swedish expat women who wanted to see their team play a friendly against the Saudi team in Riyadh. Luckily the Saudi league director changed his mind after protests in Sweden last week. The women are now allowed to attend the match in a separate section of the stadium, where they can't mix with the local crowd. No news on whether Saudi women are also allowed to attend, or if this is just a concession to the expats (source: Gulf News). 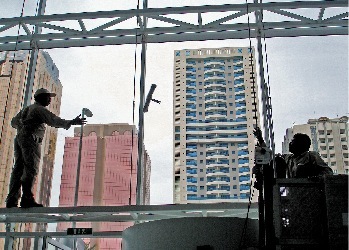 Newly released statistics show that workers deaths on construction sites in Dubai have increased again in the last year. The number of deaths has almost doubled since 2003 from 20 to 39. Non-fatal accidents jumped 66% in the last year from 105 to 175. Most of the deaths are due to falls, collapsing structures, fires and crane accidents. Interestingly these statistics exclude construction in free zones (a significant proportion of the building work in Dubai), as companies who are based there are not compelled to report accidents on their sites. But apparently safety is increasing, says the Municipality, as the land under construction has almost doubled in the last year, and "most sites have safety signs put up now, for instance." (Fawzi Al Shehi, head of Engineering Supervision Section, Building Department of Dubai Municipality). In other news there have been more protests of workers who insist that a two day weekend is their right (headlined 'Novel Demand' in Gulf News|). 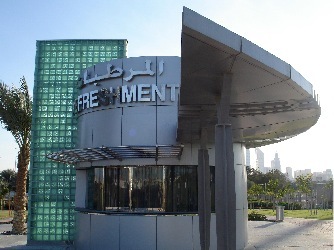 And the story of the 1500 workers who went to file a complaint at the labour ministry in Dubai, partly because the company was locking them out of their accommodation and withholding their labour cards, healthcare and salaries, only to be told that they could not submit a complaint without the labour cards, a copy to be provided by the labour ministry (one for each worker) costing 10 Dirhams each, bringing the cost of the complaint to 10,000 Dirhams. I discovered a website that seems a good idea, proposing a petition to demand the UAE sign the ILO (International Labour Organisation) convention to allow unionisation. There are two Eid festivals: one at the end of Ramadan and one to commemorate Ebrahim's offer to slaughter his son as a sacrifice on God's command (sound familiar?). Part of the Eid Al Adha festival is the slaughter of an animal, with some of the meat donated to charity. This means that for the three days of Eid there is a huge run on local abattoirs, since the government has banned the slaughter of animals in public places. Apparently only 5% of UAE nationals take their animals for slaughter at the abattoir, despite the ban. In the last few years complaints about health hazards due to free-lance butchers working in the street have increased, but the capacity of the slaughter houses has not. This means that even if people are willing to take their animal to the abattoir, they have to queue for hours while free-lance butchers wait outside the slaughterhouses to offer cheaper and quicker service. It's a mess. After empty lots and impromptu car parks on either side of our building ever since we moved in, now there are building sites going up on both sides at the same time. We have no news on the details of the building to our right (which, if high enough, will cut the stunning view from our bedrooms), but the one on our left is reputedly going to be 51 storeys high and in the shape of Big Ben (rumour has it that permission to decorate it with a clock like the original has been denied). Digging has commenced on the site to our right, whereas there are still boards being put up on the left side. We are waiting to see what happens to Cosmo, which is using some of the wasteland for its outdoor seating. Car parking has already become a lot more cut-throat in the last weeks, as there is not enough parking for all the offices along here. The empty lots masked that problem, but of course they were always going to be built on eventually. He was the ruler of Dubai, so this is a big deal. Sheikh Makhtoum Bin Rashid Al Makhtoum was the older brother of Sheikh Mohammed, who is the driving force behind Dubai's economic development. We are expecting Sheikh Mohammed, who was crown prince, to be named ruler of Dubai soon. First there was an immediate three days of mourning. This meant all malls and cinemas wer closed, banks shut for most of the week and everyone took time off. Then the Shopping Festival was cancelled, including the ambitious fireworks displays that were going to light up the night in seven different places during the opening evening. Pragmatic as ever, shops are still allowed to hold their sales, just not under the DSF banner. A week in France, a week in Germany. Sounds simple, but isn't. We visited the boat to check on it, but I was so ill with a flu that I am convinced I picked up from some visitor to the film festival (where else? All that air-conditioned proximity to people from all over the World) that I didn't notice much of the clear sunny skies and beautiful winter light. Germany was freezing, partly due to the fact that my brother doesn't think much of central heating. And partly probably because we are getting used to such mild temperatures that we forget to pack truly warm winter clothes. 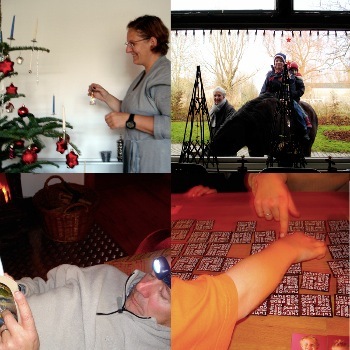 But it was still a great way to spend Christmas, it snowed and we had a proper full-sized tree with decorations and candles, lovely dinners were cooked by Ellen, Matthias and Vera and we even played card games. How very old-fashioned.